Dona Conferentes Lodge No 9392 recruits its members from care and charity teams, mainly from the Province of West Lancashire but not exclusively so. Brethren who are, or who have been almoner’s or charity stewards, are encouraged to join. Interesting and influential speakers from every part of the charity world are invited to speak to the members of their work in the community. Pictured from left to right, are: Kevin Poynton, John Wrennall and Stewart Seddon. The lodge was consecrated on 25 September 1991 and it meets four times a year. Meetings are held on the fourth Saturdays in September, November, February and April (installation). As this is a peripatetic lodge, meetings are held at different Masonic halls within the Province. These have included Silverdale, Preston, Garstang and Fleetwood. 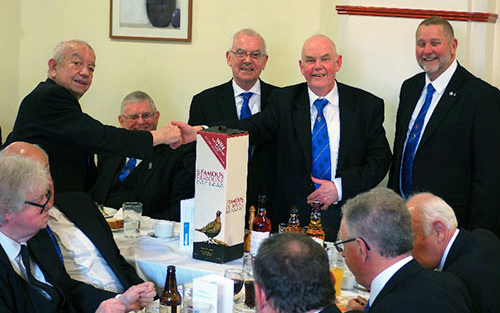 In danger of being mesmerised by this busy itinerary, Assistant Provincial Grand Master Kevin Poynton caught up with them at Lancaster Masonic Hall. 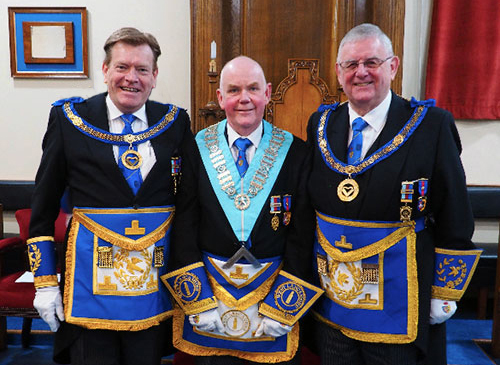 Kevin was in attendance as the principal guest at the lodge’s installation meeting. Supporting Kevin were Assistant Provincial Grand Master Stewart Seddon, Past Assistant Provincial Grand Master Frank Wilkinson, North Fylde Group Chairman Duncan Smith, along with several other distinguished guests. John-Robbie Porter led the usual salutations, after which past master Mike Casey presented master elect John Wrennall for installation. Master of the lodge Tony Farrah, with wardens Jim Gregson and Frank Kennedy in place, perfectly installed John into the chair of King Solomon within a board of installed masters, opened and closed in ancient form. After this, the working tools in each degree were presented in fine style by John-Robbie Porter. The address to the master was delivered in an excellent manner by Barry Jameson, that to the wardens was delivered with authority by David Randerson and that to the brethren of the lodge was superbly delivered by Kevin Poynton. At the conclusion of the ceremony, Kevin brought the congratulations of the Provincial Grand Master Tony Harrison to the new master. He continued by assuring the brethren that had Tony Harrison been in attendance, he would have congratulated the installing master and everyone else who contributed to this unique ceremony of installation. He also congratulated all of the new officers for taking position in this important lodge. John Wrennall (left) is congratulated by Tony Farrah. With the final business of the meeting completed and a moving ‘trowel address’ delivered by John-Robbie Porter, the brethren retired to a fine banquet during which the traditional toasts were observed. In an amusing and informative response on behalf of the grand officers, Kevin congratulated the many brothers present who were to receive appointments and promotions at the forthcoming meeting of Provincial Grand Lodge, in particular, David Randerson who was to become the Assistant Provincial Grand Master responsible for the Blackpool and North Fylde Groups of lodges and chapters. He also congratulated Duncan Smith on his imminent promotion Assistant to the Provincial Grand Principals. Kevin followed this by exhorting brothers to join the Royal Arch who hadn’t already done so, describing this as the logical next step in their Masonic journey. Kevin went on to praise the lodge for a wonderful installation, which was educational and inspirational. He also thanked the lodge members and their guests for their generosity towards the raffles and donations, which raised over £700 for Masonic and non-Masonic charities from the meeting alone. Raffle winner John Humphries (left) is congratulated by John Wrennall. 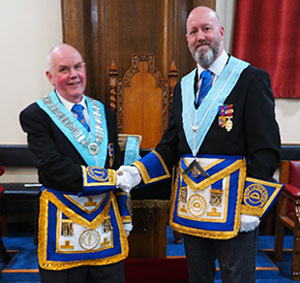 He commended the lodge charity steward David Brumwell for the work he was doing and all the other charity stewards for the work that they do in their other lodges. Kevin also thanked them all on behalf of the recipients for their generosity. Kevin continued by thanking the acting Provincial grand officers in attendance for the work that they had done during the year and concluded with a resounding thank you message to all of the work carried out by group publicity officers in the Province. New master John Wrennall, in responding to the toast to his health, thanked everyone for attending, particularly those members who had taken offices for the year. He praised Tony Farrah for his excellent ceremony of installation and looked forward to seeing everyone at the forthcoming meetings. The next meeting will be held on Saturday 22 September 2018 at Eccles Masonic Hall. Pictured from left to right, are: John Robson, Barry Jameson, Graham Halsall, David Kenworthy, Frank Wilkinson, Howard Savage, Kevin Poynton, John Wrennall, Stewart Seddon, Les Savage, Duncan Smith, David Randerson, David Rigby, Jim Woods and Peter Greathead.